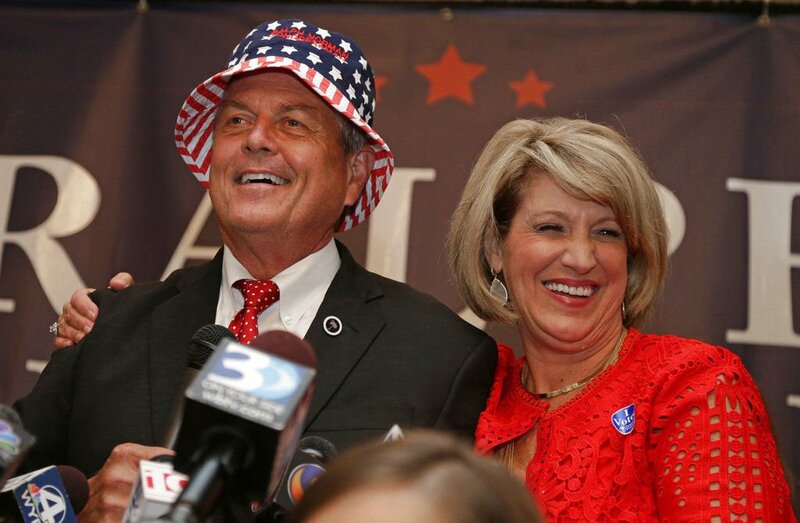 ROCK HILL — Republican Ralph Norman won a special congressional election Tuesday in a sign that Republican support in the Palmetto State is unwavering in the era of President Donald Trump. The former state lawmaker and real estate developer from Rock Hill defeated Democrat Archie Parnell, a former tax attorney and business manager for Goldman Sachs from Sumter, in a race that decided who would replace Republican Mick Mulvaney, Trump’s new budget director. Norman, who was just elected to his sixth legislative term in the most populated part of the South Carolina's 5th District last year, received nearly 45,000 votes, while Parnell collected a little more than 42,000 votes in his first ever political contest. Norman’s home county of York provided the final push he needed to carry the election, handing him around 54 percent of the more than 37,000 votes cast in the county, according to unofficial returns. But Parnell still came within about 3 percentage points of beating Norman in a district that Mulvaney won by 20 percentage points in November over Democrat Fran Person, a former aide to Vice President Joe Biden. Democrats worked to get turnout for their underdog. Parnell received more than twice the number of votes Tuesday than all of the ballots cast in the three-candidate Democratic primary in May. Norman received 15 percent more votes Tuesday than the entire seven-candidate GOP primary field last month. Norman delivered his victory speech at the Magnolia Room in Rock Hill, which was built by the company he inherited from his father. A large crowd packed the event center for most of the night as they waited for Norman to arrive, drinking wine and snacking on a buffet of food under the glass chandeliers that adorned the hall. Norman arrived after the race had been called for him, shortly after 9 p.m. He made his way down a gauntlet of people with his wife and family by him before taking the stage. "It's time to govern. It's time to get things done. It's time to go to work," Norman told the crowd. "Folks, tomorrow and together we're going to start anew," he said. "What Washington desperately needs now are citizen legislators that are dedicated to leading a free people and to maintain our god given right to the pursuit of life, liberty and the pursuit of happiness." The results in the 11-county district maintains the state Republican Party's dominance in recent congressional elections, and dashes any Democratic hopes of flipping one of South Carolina's seven congressional seats before the 2018 mid-term elections. "What we did here is remarkable," Parnell told a room full of supporters at Serendipity Catering and Cafe in Sumter. "We stood together against the rising tide of division." Parnell told reporters he wasn't ready to think about another run in next year's congressional race for a full two-year term, but didn't rule it out. "I hope that the strength of our showing will resonate and so that people will hear that something is going on that cannot be ignored," he said. Another special election decided in neighboring Georgia on Tuesday drew far more national attention, with political observers viewing that race as a litmus test for how a Trump administration will affect congressional races next year. The outsized attention on the race also contributed to the contest becoming the most expensive U.S. House race in the country’s history. Republican Karen Handel won the seat in suburban Atlanta over Democrat Jon Ossoff. The election in South Carolina, where Trump's overall approval rating remains above 40 percent — according to the latest Winthrop University poll, was far less expensive. South Carolina Democratic Party Chairman Trav Robertson said that had the 5th District race gotten a "scintilla" of the national money and attention as the race in Georgia, things would have gone differently for Parnell. "Our hope is that what Archie's campaign was capable of doing in such a short time with limited resources can be a light from which people see a path to victory," he said. Some GOP political operatives took to social media Tuesday to say more Republicans would have come out for Norman if the Democrats nationalized the South Carolina race. The seat was already known to favor Republicans, especially after the state Legislature redrew the state’s congressional boundaries in 2011 and reduced the percentage of black voters in the district, said Winthrop University political scientist Scott Huffmon. Parnell, who also worked as an attorney for the U.S. Department of Justice in the 1970s, ran as a moderate Democrat who focused on fixing the Affordable Care Act and changing the country's tax code to stop corporations from sheltering profits in other countries. Norman, however, pitched his candidacy as a continuation of the fiscally-conservative policies advanced by Mulvaney during his six years in office and never shied away from Trump’s legislative agenda — much of which has yet to advance in Congress. The Rock Hill resident supports the U.S. House bill that would repeal President Barack Obama's signature health care law and, according to the non-partisan Congressional Budget Office, cause an estimated 23 million more people to lose health insurance coverage by 2026. He says he would consider shutting down the government to stop a vote on raising the federal debt ceiling, and he supports Trump's proposed budget that would increase funding for the U.S. military while slashing $1.4 trillion in non-defense spending over the next 10 years. "I firmly believe that with President Trump in the White House, we have such a great opportunity as conservatives. We have conservatives in the House, the Senate and the executive branch," Norman said, adding that he may have disagreements with the president from time to time. Norman was attacked during the Republican primary for voting to remove the Confederate flag from the South Carolina Capitol after the racially-motivated murder of nine black worshipers in Charleston in 2015. During a Republican runoff election in May, Norman defeated Tommy Pope, another state lawmaker and former solicitor, by 221 votes. In the lead-up to that contest, there were political attack ads aired that pictured Norman speaking against a legislative bill that extended workers compensation benefits to police officers suffering from post-traumatic stress disorder. Once he is sworn into his new office, Norman has said he’ll join the House Freedom Caucus, a group of Republicans that have clashed with their congressional party leadership on issues including the initial health care repeal effort that never received enough support to go to a vote. During his time in the state Legislature, Norman has been known to oppose bills that were supported by large bipartisan majorities, including highway financing efforts, $40 million in flood relief for South Carolina farmers and extending state bonds for the development of the Boeing aerospace factory in North Charleston. "I think now is the time to get government off the backs of business. Now is the time to enforce the 10th Amendment, to give state's rights back. Now is the time to get our fiscal house in order, folks," Norman said. "Now is the time to put faith back in the political arena."